Well, here’s more Shadespire stuff! I finished these a while back, but have now had the time to photograph them. It’s a very bleak day out here in Belgium, so the colours appear very washed out. Regardless, I wanted to get another blog post out there, so we’ll make do! 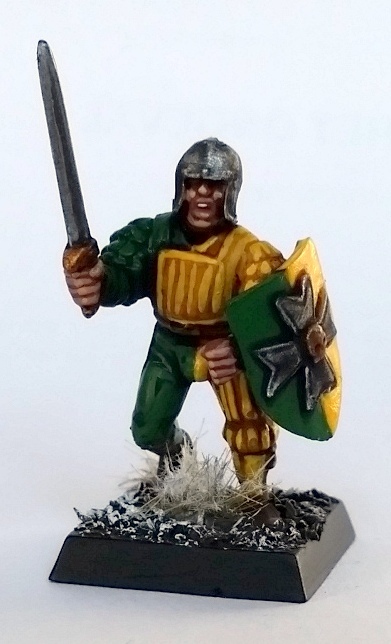 As ever, I wanted to do something a little different with the paintjob of my warband – especially as GW’s official yellow armour scheme doesn’t sit well with me – so here they are. More metallics, dark green lacquered plates, red cloth and spots of rust to contrast all of it, and of course copious amounts of blood effect. These plastics, although unipose and push-fits, are very well thought out, so kudos to GW’s design team. I did end up sticking them together, though. I did consider swapping out their bases for squares so as to use them in WHFB or somesuch, but as the feet are moulded onto the bases themselves this was not an option. Oh well. Still no game of Shadespire under the belt, though! It doesn’t seem quite to have taken off in my area as it has in many other places. Regardless, I’ve had a lot of fun painting these and the other models. I’m still on the fence about picking up the other expansions due early 2018 – that’ll depend on the models and the rules. My mate Flor and I have recently started up a Frostgrave campaign using the Thaw of the Lich Lord scenarios and random encounter table, and as I noticed there were plenty of monsters of the ethereal kind, I’ve gone and added a box’s worth of these GW Spirit Hosts to my collection. First off: these are an absolute nightmare to build. The different ghostly tentacles have to be glued together at specific locations where they pass eachother, at very minute contact points which are not at all clear to identify. These joins end up being very brittle, and if you don’t line them up 100% correctly you’ll then have trouble gluing the heads on – the ‘hairs’ will start interlocking means the heads won’t fit. These Spirit Hosts are quite possibly the worst plastic kit I’ve ever had to assemble in my fifteen years of hobby experience. Still, once painting got underway, I had a lot of fun. Over a white undercoat I basecoated gauss blaster green, then sybarite green, then kabalite green, but I applied these basecoats increasingly away from the face, arms and tips of the lower ‘bodies’, effectively creating a transitional effect from white to a middle dark green. The weapons were basecoated silver, and after this I washed the models entirely in coelia greenshade. Once dry I applied white highlights to the faces, arms and ‘tails’ to bring the detail back on them, and I applied a sepia wash to the skeletons on the bases. The sand on the bases was painted dark brown and then both the bases and the skeletons were given a white drybrush. It’s so simple, which is also why I like them so much I decided to show them to you. I’m slowly but steadily filling up the random encounters table for Frostgrave, and it’s one I’m approaching rather piecemeal. There was a wraith in the main book, but now it seems there’s a further few ghostly types in the Lich King supplement – so I guess I’ll be using the model below fairly frequently! 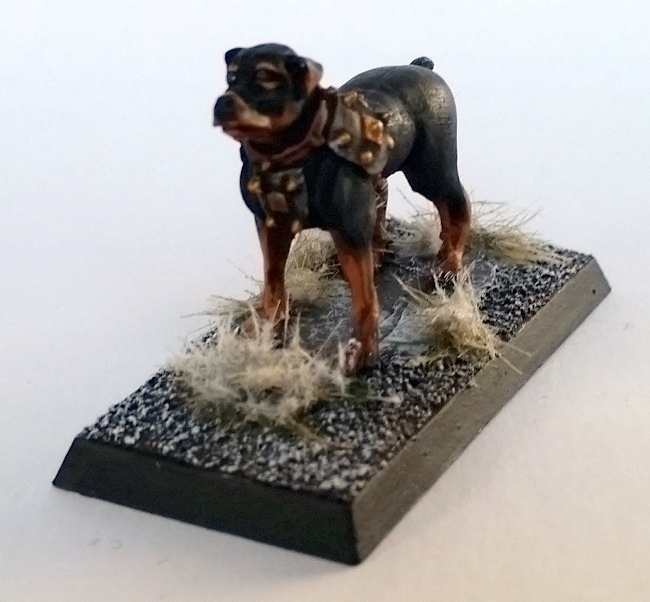 I find these GW clampack character models to be fairly good – expensive but well detailed. This one was a bit tricky to put together, owing to the strange way in which it’s been cut up during development. I worked from a white undercoat, of course, with the light colours I was aiming at. I then basecoated everything: gauss blaster green and baharroth blue for the robes, sybarite green for the bodice, flayed one flesh for the skin, celestra grey for the hair and silver for the metal. Then, of course, a coelia greenshade wash over everything, followed by a drakenhof nightshade wash over the metal bits. Once dry I just reapplied all the base colours as a layer highlight. Finally, I painted in the eyes and teeth with white. Super easy! I really like the way the palette came out, especially the cold flesh tone. Hope you like it too. I have a few more updates coming soon, I just need to wrap my head around WordPress’s new publishing layout. I liked the old one much better, but then again I’m becoming an old grognard. 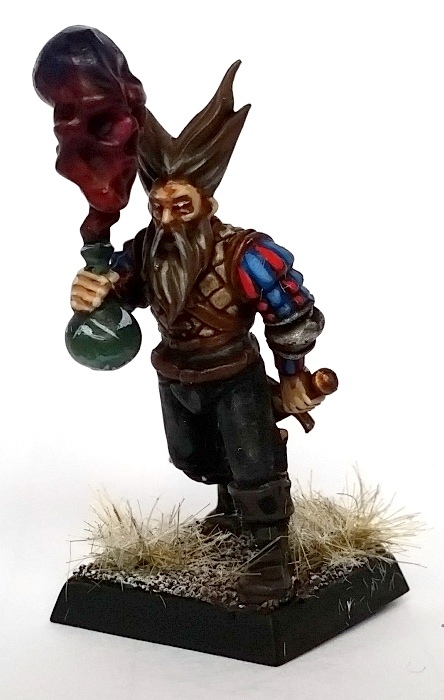 I’m having another trial game of Frostgrave next Thursday, so I’ve gone out of the way to get some more warband models painted up for a proper demonstration of the game. 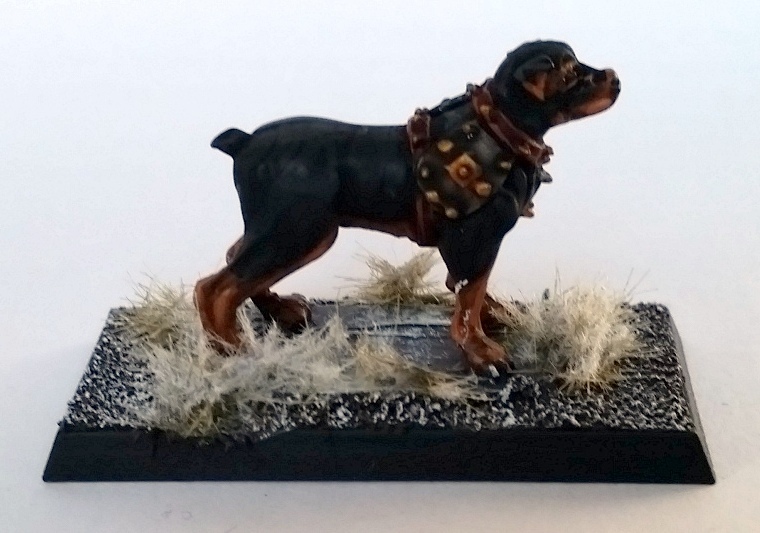 First and foremost is my apprentice – no wizard should ever leave their hideout without one – who is a kitbash of several plastics – a Mordheim/Free Company body, Greatsword arms and Empire Wizard head and right hand. A kitbash of various plastic GW kits. 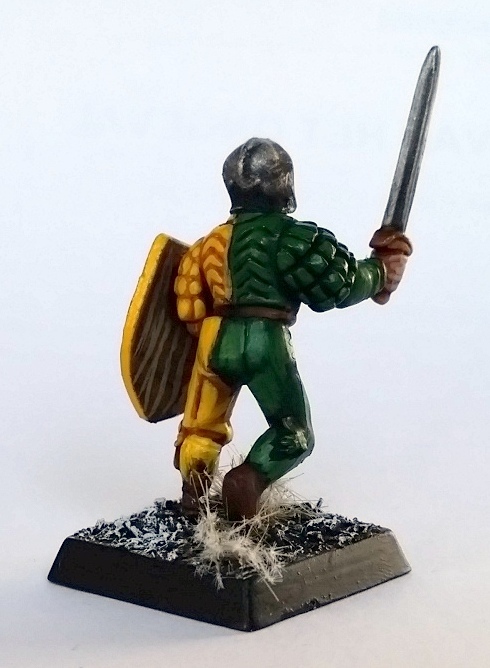 First and foremost is my apprentice – no wizard should ever leave their hideout without one – who is a kitbash of several plastics – a Mordheim/Free Company body, Greatsword arms and Empire Wizard head and right hand. The idea behind him is that he’s clumsily opened up a potion flask and is mortally shocked by its demonic contents – hence the cartoony hair with its grey streaks! I tried to tackle the demonic skull thing an inside-out layering technique so that the light would appear to be shining from inside it, but that ended up looking shite so I made do with a red-to-magenta-to-purple transition washed in purple. It’s not as impressive but I’m happy with it. Three repurposed Flagellants, also from GW. What did work out better were the flames on the brazier of that guy on the right. Quite pleased with them! I’ve wetblended these going from white to yellow to orange to red to dark brown. Picking out the bits of brazier in among the flames was hard, but I think I managed alright. 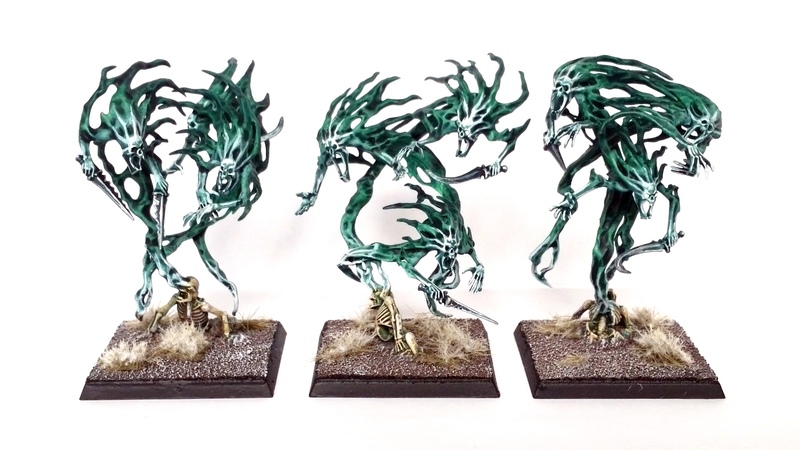 These models were originally meant for a spirit host for my hybrid Vampire Counts/Empire army, and they’ve finally seen some brush love now. They’ll be used as warriors in Frostgrave – unarmoured, heavy weapon-wielding chaps. 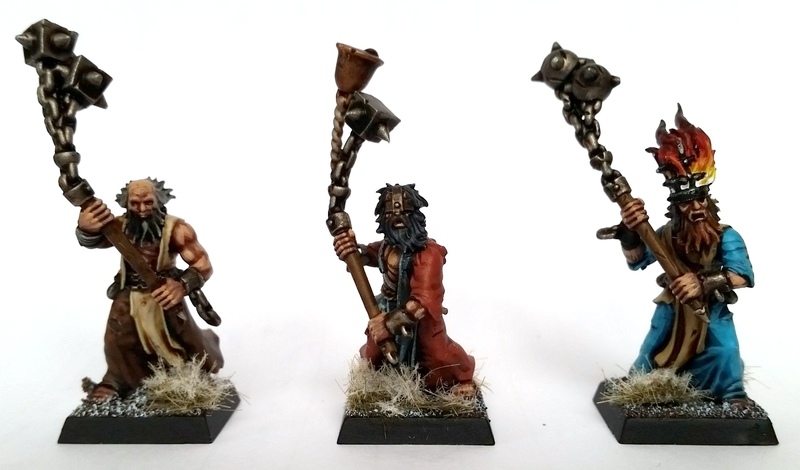 They’re a bit over-the-top but they look expendable, which is just right for Frostgrave henchmen! Well that’s that then! A second blog post done and we’re not even properly into the weekend yet. Check back tomorrow for more Napoleonic goodness, or perhaps WSS, or maybe even Red Devils… All bets are off this weekend!